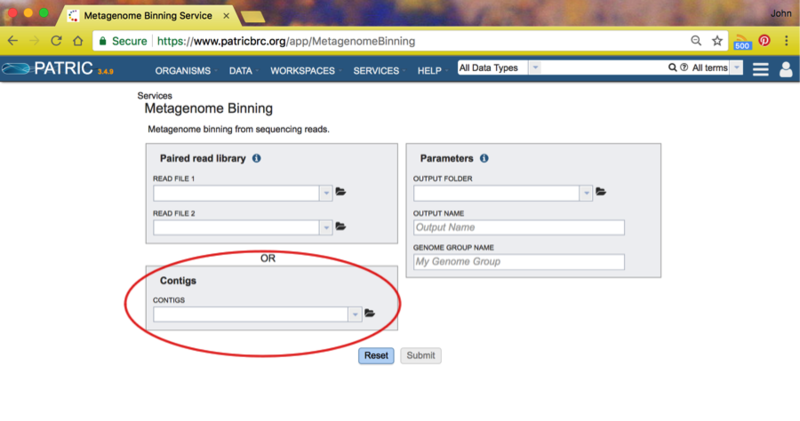 For a description of how the service constructs the bins, see Reconstructing Genomes from Metagenomic Samples Using the RAST Binning Service (RBS). Log in to the PATRIC web site with your PATRIC credentials. Input to the Binning Service must be found in a PATRIC workspace. You can upload files or use pre-existing files in your Workspace or in other Workspaces available to you. 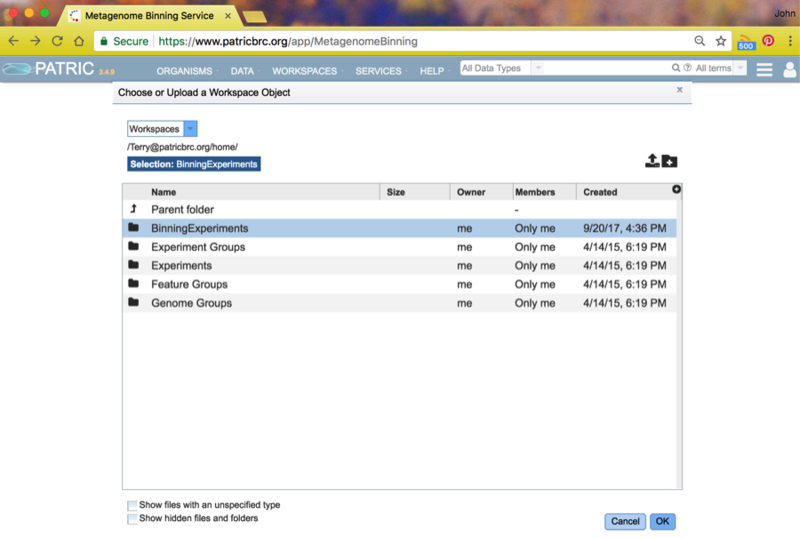 See Workspace User Guide for more information about using the PATRIC Workspaces. You can supply paired reads for assembly, or you can supply assembled contigs. For these tutorial purposes, we will assume you are using a set of contigs found in a public workspace. Start by clicking the folder symbol next to the contigs box. This will open a Workspace browser. Click on the Workspaces dropdown and choose Public Workspaces. You will see a number of public workspaces. Choose the binning workspace by clicking on the icon to the left of the name Binning. And finally, choose the dataset SRR2188006.contigs.fasta. This will then take you back to the Binning Service start page. If you specify contigs as input, the coverage information is computed from the contig IDs or comments. Inside the contig ID, we look for the keywords cov, covg, or coverage. The coverage value is taken from the following number, with an underscore expected as the separator. Thus, a contig ID of NODE_20_LENGTH_8732_COV_21.5064_ID_287776 would indicate a coverage of 21.5064. Most assemblers produce contig IDs of this form. We will also look for keywords in the comment field. The keyword can be any of the above or the word multi. The coverage number should follow the keyword with an equal sign expected as a separator. Thus, coverage=21.5064 in the comment would indicate a coverage of 21.5064. If no coverage information can be found, a value of 50 is assumed for everything. Next, choose an output folder by clicking on the folder icon next the Output Folder choice. This will take you to the workspace browser where you should choose whatever Workspace folder you like. In this case, we have already created a folder named BinningExperiments, and we will select it and click on OK. This will return you to the Binning Service start page where you will fill in the output file name and genome group name you want for this run. We chose SRR2188006-1 for both. These are the names of the respective folders where you will find the result of the Binning run. The binning job will start annotation jobs, as you can see in the above screenshot. The run we made previously today was job SRR218806 and spawned two annotation jobs. When all the spawned jobs are complete, the Binning Service run is complete. Refresh your page to see the updated status in the right-side panel.